Cancer is a grand health challenge of modern times, being the second leading cause of death. Despite tremendous investments in this field, the prognosis of cancer has not improved substantially. There have been some advances in cancer chemotherapy and radiation therapy, but other treatment options, such as surgery, burn, immunotherapy, etc remain primitive and far from being perfect. Chemotherapy, the “holy grail” of cancer treatment, is based on targeting certain biomolecular pathways in the complex cascade of cancer progression. However, the limited understanding of cancer biology often makes this a fishing expedition. As a result, many of the currently available anti-cancer drugs are non-specific and less effective. Heterogenicities in cancer pheno- and geno-types, often make the identification of genuine targets difficult. However recent advancements in genomics, metabolomics, transcriptomics, and molecular biology have fuelled major research projects in the fields of oncology and anti-cancer drug discovery and development. The scientific literature is now full of exciting discoveries against this disease of modern society, cancer. It is often difficult, even for a prolific reader, to keep pace with these developments. Thus, the need of a comprehensive book review series is greatly felt. 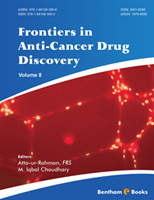 The last seven volumes of the ebook series “Frontiers in Anti-Cancer Drug Discovery” have attracted major interest, making this series a welcome addition to the global literature on this dynamic topic. The present 8th volume of this internationally recognized books series comprises six carefully selected topics focused on various aspects of cancer chemotherapy and cancer biology, contributed by leading experts in this field. Each chapter deals with anti-cancer drug discovery and development based on various innovative approaches, including identification of new molecular targets, manipulation of cancer microenvironment, and outcomes of pre-clinical and clinical studies on new drugs, and combination therapies. Amedei et al. have reviewed the recent progress in the use various immunotherapies in cancer treatment in chapter 1. Their emphasis is on the treatment of gastrointestinal cancers by T-cell based immunotherapies. T-Cells, also called T-lymphocytes, are a subtype of white blood cells that play a central role in cell-mediated immunity. T-Cell based immunotherapies have attracted considerable scientific attention. However, T-cell based immunotherapy of cancers is not free of adverse side effects. In chapter 2, Cheng et al. have contributed a comprehensive review on the anticancer activity of the newly discovered compound adjudin, a well-known male reversible contraceptive used in animals. Adjudin is a structural analogue of the anticancer drug lonidamine. Apart from its known potent anti-spermatogenic activities, adjudin is found to have many other biological properties. Notable among them is its activity against neuroinflammation, protection against gentamicin-induced ototoxicity, and prevention of cancer growth and development. The authors have critically reviewed the recent literature on new indications of this old contraceptive drug. The focus of the article is on recently discovered anticancer activities of adjudin, either alone or in combination with other anticancer drugs as well as with nanocarriers. Adjudin, similar to lonidamine, inhibit cancer growth by targeting mitochondria and blocking energy metabolism in certain kinds of tumor cells in mice, indicating that it is potential anticancer agent. Tumor microenvironment (TME) plays an important role in the progression of tumor growth, and treatment outcome. This cellular environment includes surrounding blood vessels, immune cells, fibroblasts, bone marrow-derived inflammatory cells, lymphocytes, signalling molecules and the extracellular matrix (ECM). Recently TME has been identified as potential target for novel cancer chemotherapies. Mabtel and Pepper have contributed a comprehensive review in chapter 3 on the role of tumor microenvironment in tumor progression, angiogenesis, cellular invasion, metastatic dissemination, resistance against chemotherapy and its potential as drug target. Recently developed treatments which can modulate TME against tumor growth, along with their mechanisms of action, have also been discussed. In chapter 4, Fatima et al. have focussed on the current and emerging therapies for the treatment of hepatocellular carcinoma (HCC) or malignant hepatoma. Hepatocellular carcinoma accounts for most liver cancers, and is a leading cause of cancer related deaths. HCC occurs more frequently in men than women and is usually diagnosed in people of age 50 or older. HCC’s prognosis is among the poorest of all cancer types. This review provides a detailed description of various treatment options for HCC, and their advantages and disadvantages. Future directions of development in this field are also reviewed. Gold complexes are known for a variety of biological activities. In chapter 5 Sun et al. discuss the anti-cancer properties of gold-based compounds and their potential. After the serendipitous discovery of cisplatin, a platinum (II) based compound, as a potent anti-cancer agent, interest in metal complexes has increased exponentially. Sun et al. have critically reviewed the recent literature on the therapeutic potential of novel gold complexes (I and III), particularly against various cancers. In the last chapter, Anreddy et al. have reviewed the application of nanostructures as oral drug delivery vehicles for the treatment of various cancers. One of the key issues in cancer chemotherapy is that the most potent anticancer therapies can only be administered through injection, as their oral drug delivery is associated with many limitations. This makes cancer chemotherapy quite challenging. Recently many new classes of nanoparticles (NPs), such as liposomes, polymeric NPs, polymeric conjugates, micelles, dendrimers, polymersomes, and metallic and inorganic NPs, have been developed as new drug delivery vehicles for oral administration in cancer chemotherapy. These nanoparticle-based anti-cancer drugs are often devoid of problems such as poor solubility, low intrinsic permeability, and metabolic changes. The potential of NPs in on-target and sustained administration of drugs is also discussed. We wish to express our sincere gratitude to all the authors for their excellent scholarly contributions to this 8th volume of this book series. We also appreciate the efforts of the impressive production team of Bentham Science Publishers for the efficient processing the treatise. The efforts of Ms. Fariya Zulfiqar (Assistant Manager Publications) & Mr. Shehzad Naqvi (Senior Manager Publications) and excellent management of Mr. Mahmood Alam (Director Publications) are greatly appreciated. We also hope that like the previous volumes of this internationally recognized book series, the current volume will also receive wide readership and recognition.